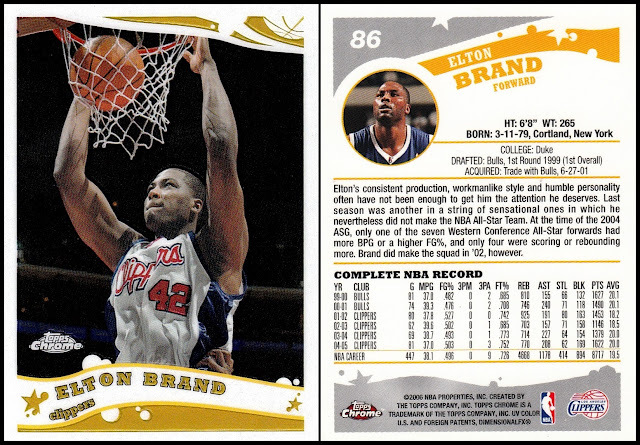 As I mentioned in my 2015 Goals post, my only specific collecting goal for 2015 is to add more than 11 Elton Brand cards to my collection. 11 was my total for new cards of him added to my collection in 2014. 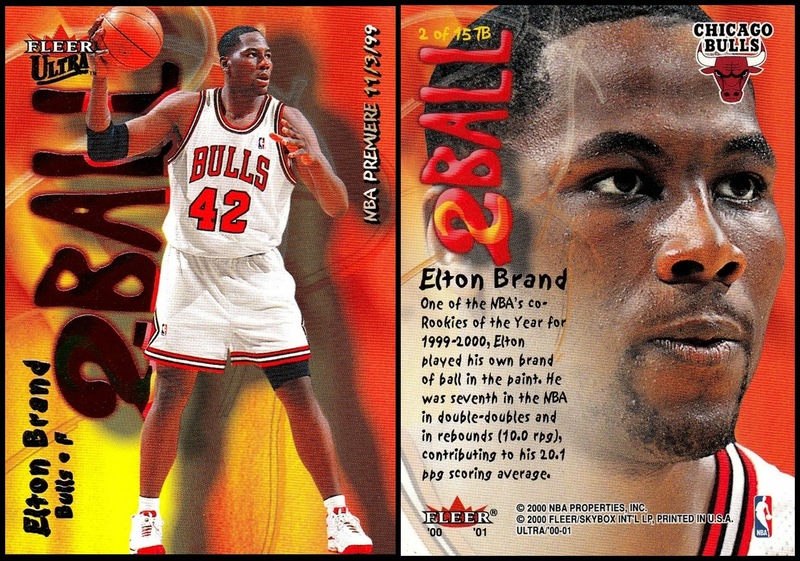 Elton is my favorite player. I thought I would make this page and keep it updated as new cards of him arrive to my collection. As I type this on January 9th, I've already added three since January 1st, so that is a very good start! My first Elton card came on January 1st. I knew I was approaching 77,000 different cards, and saved one of the mixed boxes so I could hit that mark on the 1st of the year. It turned out to not only get me to that mark, but I got two new Eltons and one new player, who only got one card. This was the 8th card added to my collection in 2015. 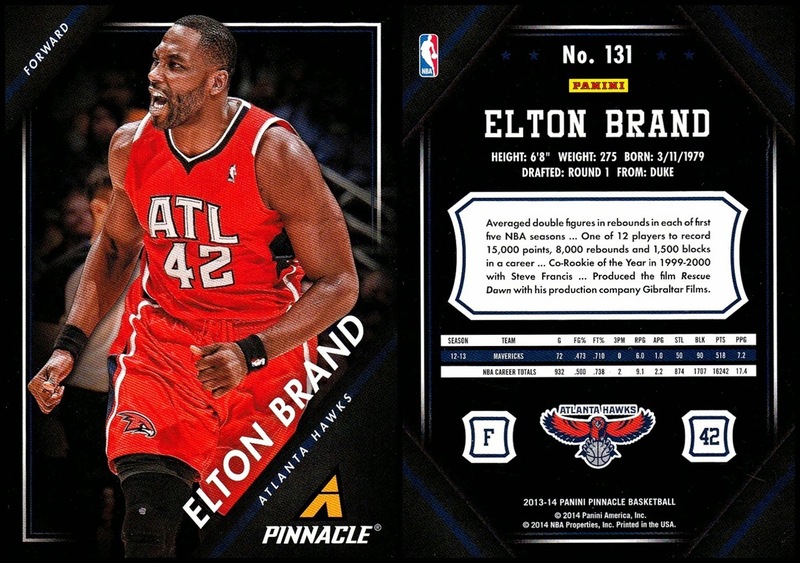 Also added to my collection on the 1st, this is my only Elton card showing him in a Hawks uniform. He joined the team in 2013-14 and they mostly sit him on the bench for no apparent reason. 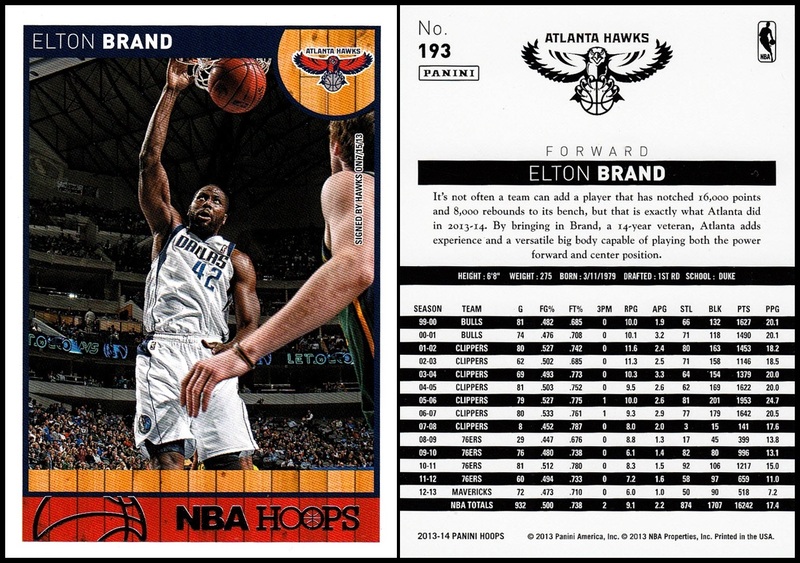 Also for some reason, Panini has chosen to stop including him in sets so this is in fact his only Hawks card (well, it and the half dozen parallels). I added this next card off of Ebay. 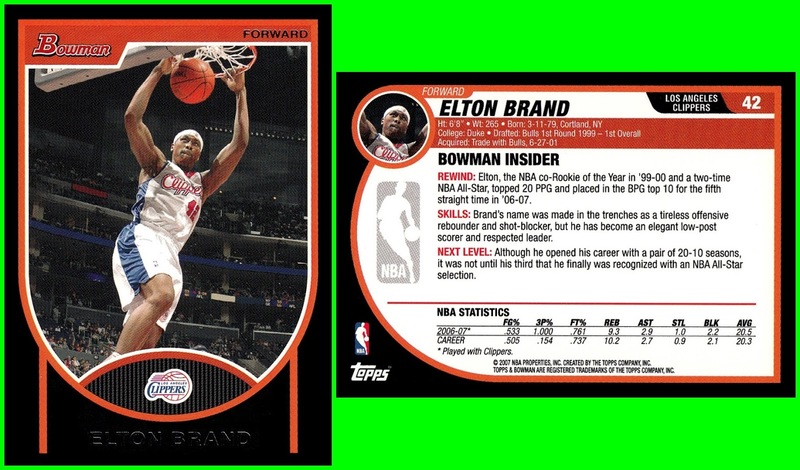 Even though it's numbered to 10, it's not my lowest numbered card of Elton, I have a 1/1 from 2003-04 Bowman Signature. 4. 2009-10 Upper Deck #146. Added on 1/29 from a clamshell my brother got for me at Target. 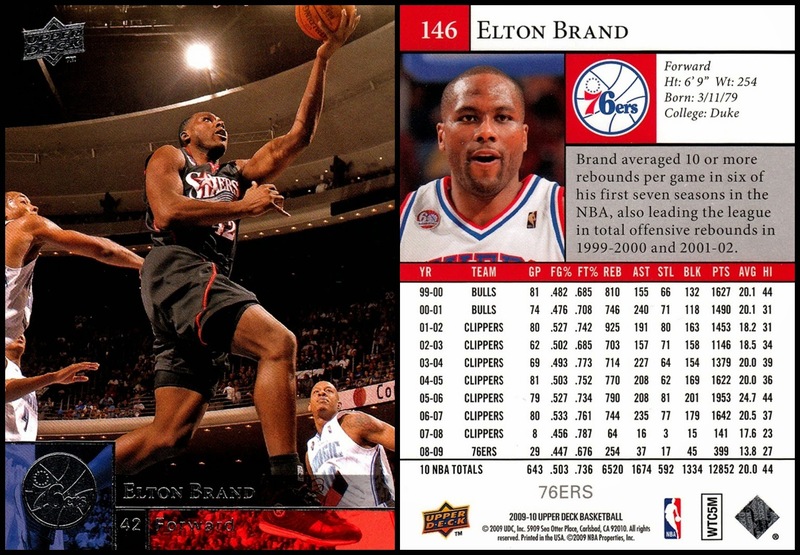 This is, I believe, the only card I have of Elton in the jersey that the Sixers debuted in 1997-98. The next batch come from my friend Ricky, who sent me a huge 16 pound box of cards on January 31st. 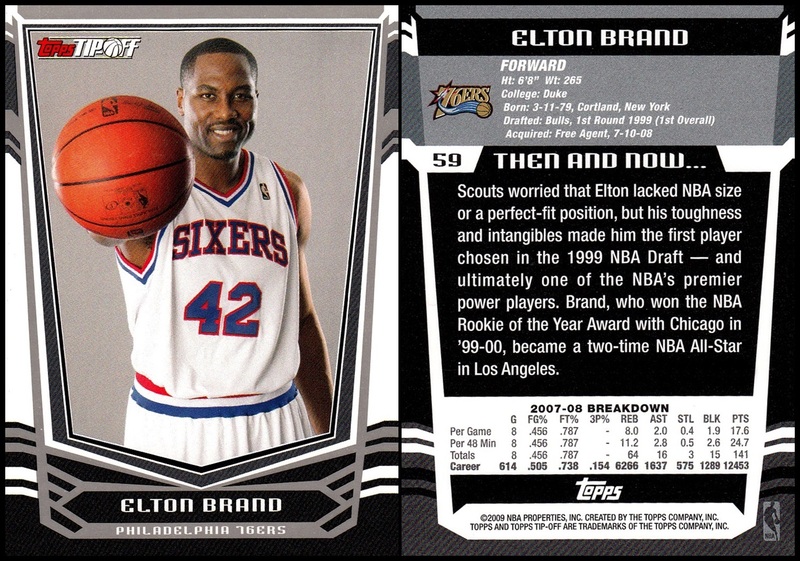 Included in that was a 25 card lot of Eltons, and he was hoping a few would be new. Some were! 5. 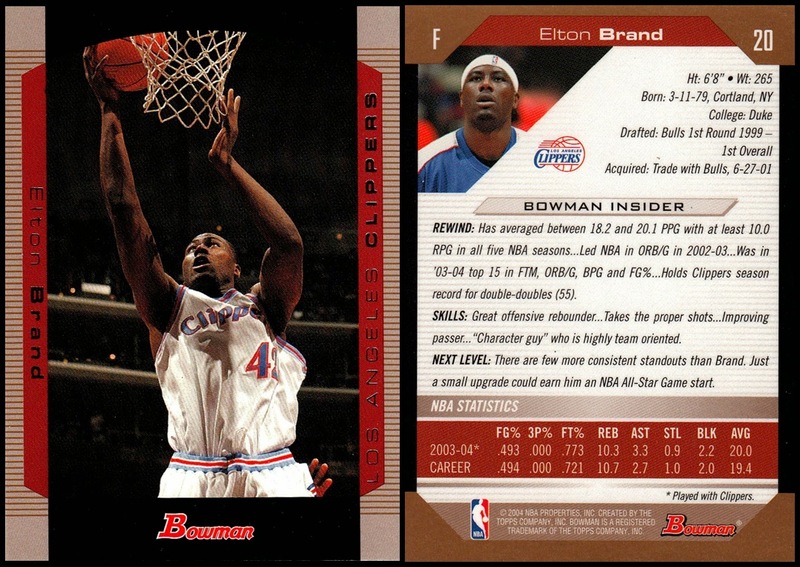 2004-05 Bowman Gold #20. 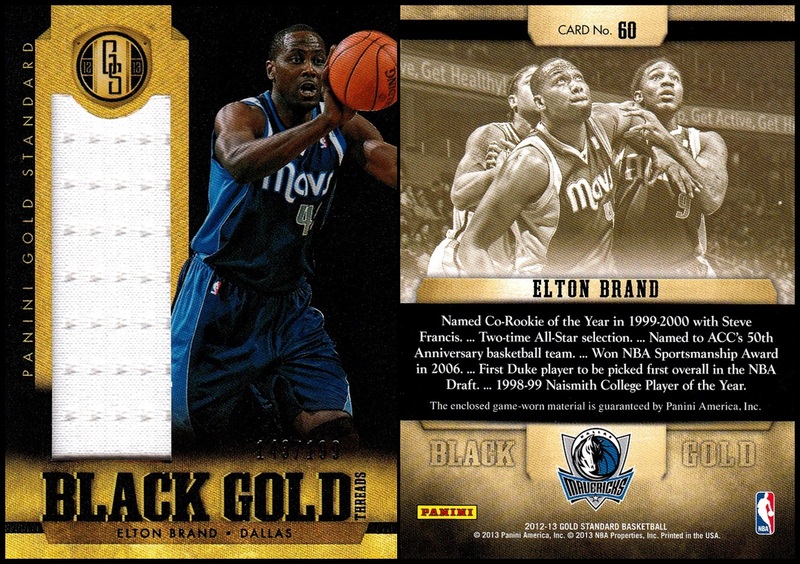 These Gold cards were issued one per pack, unless there was a relic. 6. 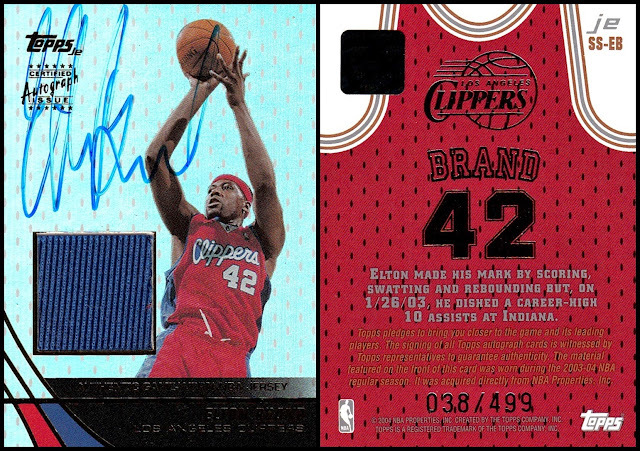 2004-05 Skybox Fresh Ink Property Of #12PO. I did not do a box of Fresh Ink so I don't have that many of them. 7. 2000-01 Ultra 2Ball #2TB. Not my favorite year of Ultra, but it's hard to top the 5 sets that came immediately before this one did. I now have 13 of the 15 cards in this insert set. 8. 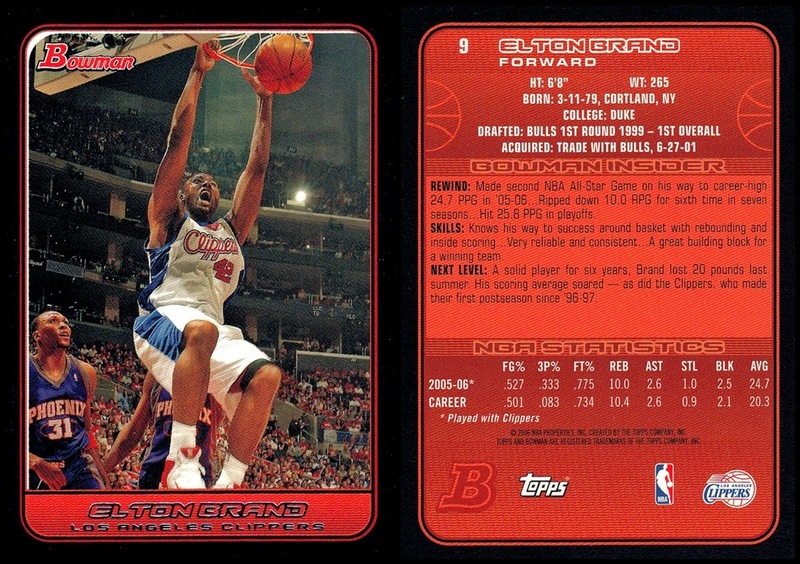 2000-01 Fleer Focus Arena Vision #8AV. This is one of the few sets issued at this time that is very poorly represented in my collection. I did not do a box, which makes it, I believe, the only set from 2000-01 that I did not. I did not have any of the Arena Vision cards before. 9. 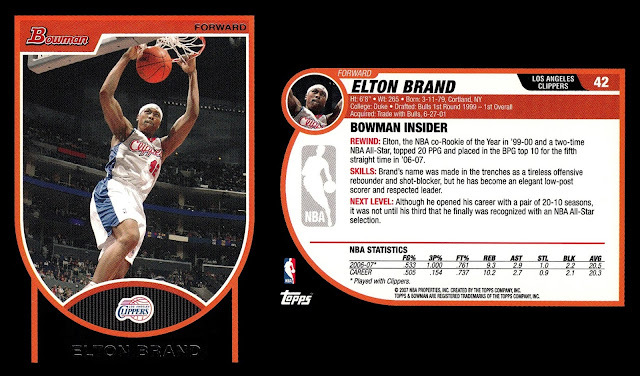 2006-07 Bowman #9. I did exactly 1 pack of this set when it was new. 10. 2006-07 SP Authentic #34. Bonus- this is my very first card from this set, so that makes it extra important. 11. 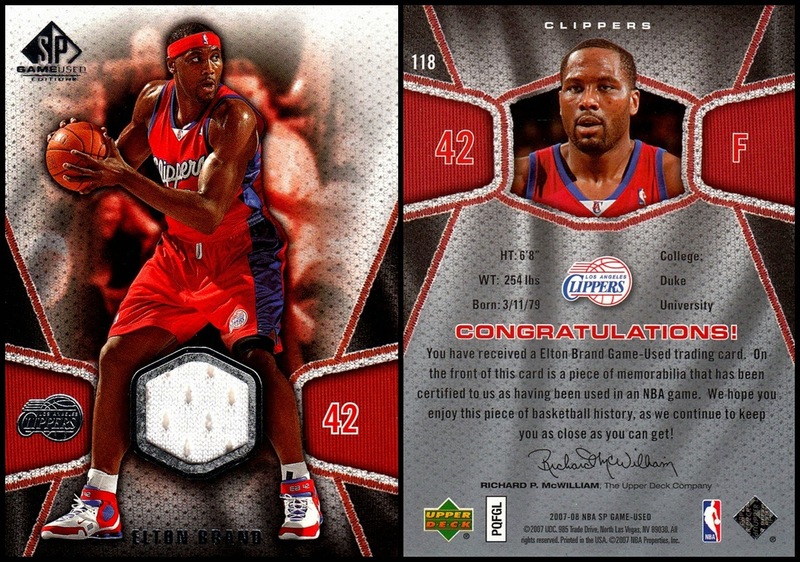 2006-07 Bowman Chrome #9. In each pack of Bowman, you got (IIRC) 4 base, 2 Chrome, and one other card. I have matched my 2014 total by January 31st! 12. 2008-09 Topps T-51 Murad. Pulled from a mixed box on 2/11/15, which puts me at my goal for the year of getting more than 11 Elton Brand cards! 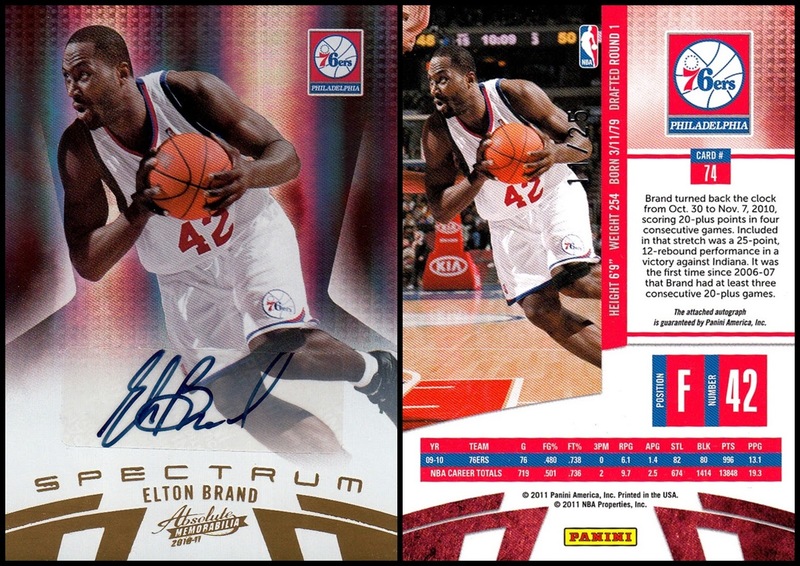 The year continues to go well for my Elton Brand collection, as I added two more on March 18th. Unfortunately both are mirror foil, which I can't stand. But they are still Elton, so it's still a win! 13. 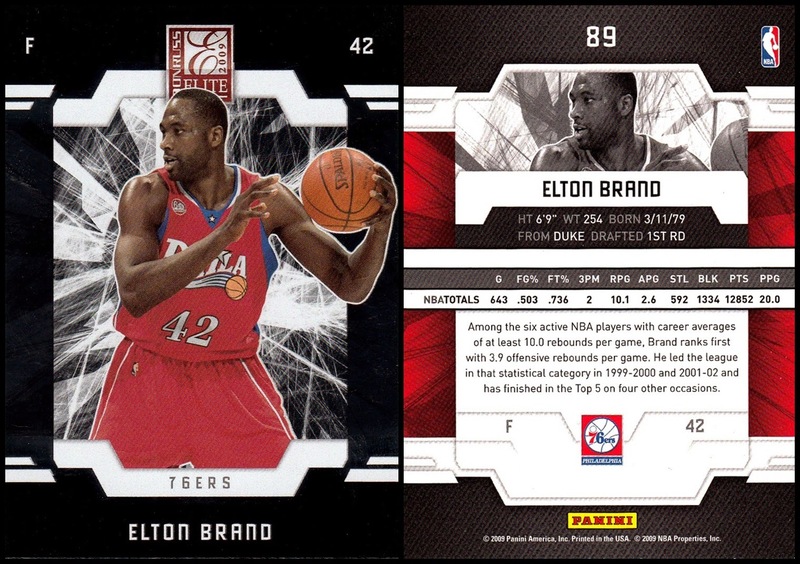 2009-10 Donruss Elite #89. I had previously had a jersey variation of this one. 14. 2012-13 Absolute Basketball #9. As you may recall from the top of the page, I purchased the Platinum Spectrum parallel numbered to 10 on Ebay earlier this year, but I didn't have the base card. 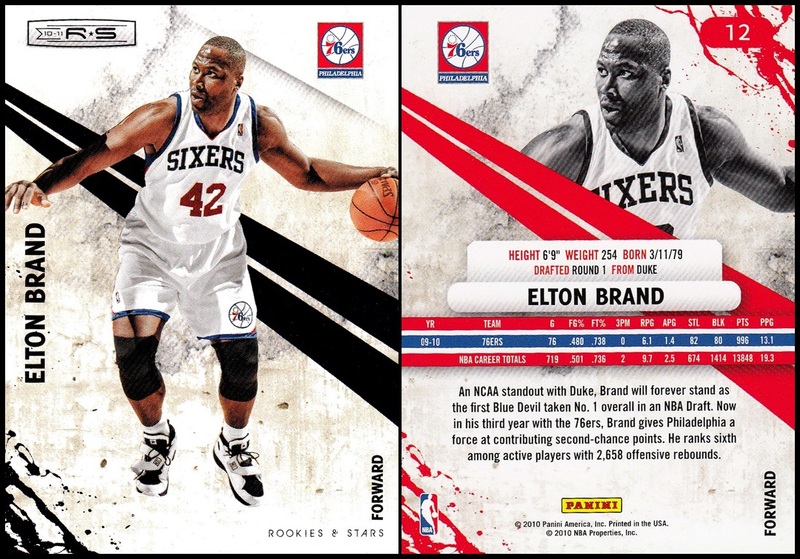 I found three rack packs at my Local Kmart, and the Elton card was in the first one (and only, so far) that I opened. It has a minor ding on the bottom left, as all the cards in the pack did, but that's OK.
#15 is a big one- my first NBA logo patch! 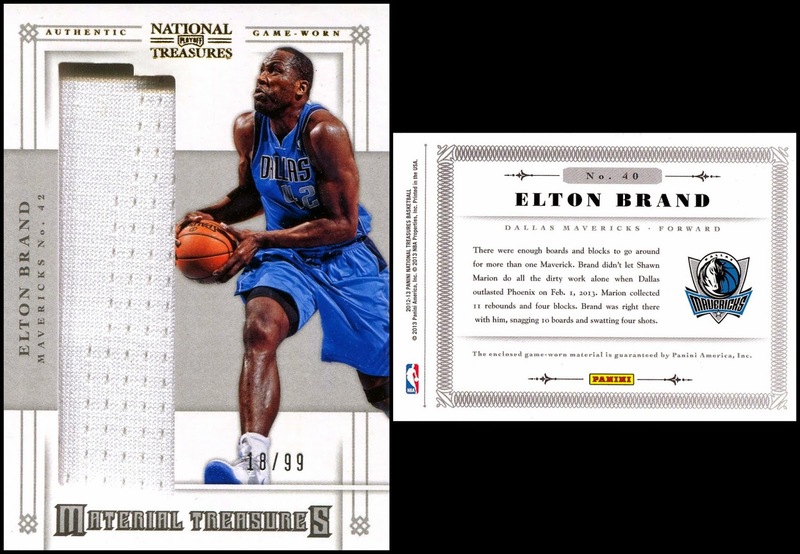 2004-05 Fleer Throwbacks Hardwood Classics Jersey & Patch. I found this card on COMC, and balked about paying the asking price. My mom found out about it and bought it for me! #17. 2010-11 Prestige Bonus Shots Black. 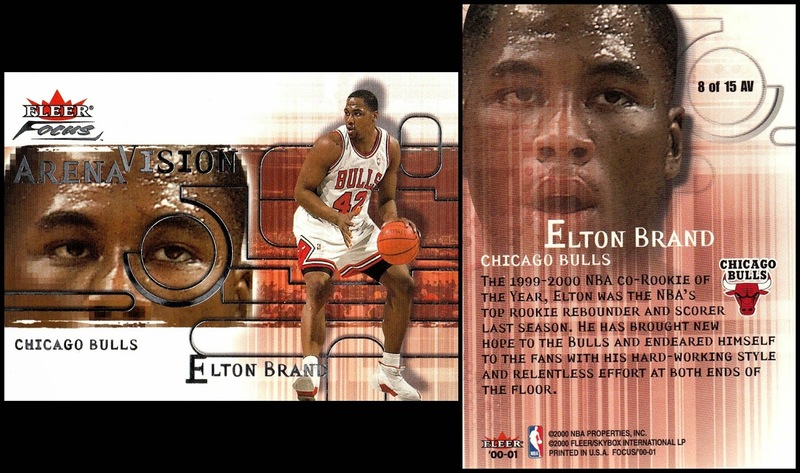 I had a few dollars in Ebay Bucks and typed in Elton's name to see what I could find. This card was one of the first listed, but it was not a BIN. I put in a bid, waited several days, and then several more days later it arrived in the mail. It's numbered 3 of 10. 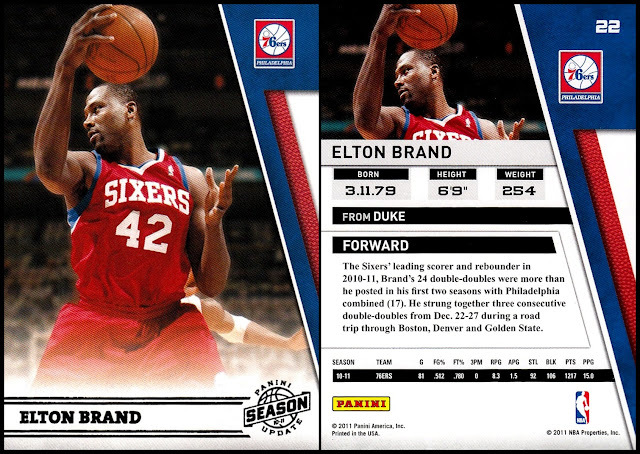 This is the second Elton card I've received in 2015 numbered to 10. As I may have mentioned in the past, I very nearly died in 2013. I came literally about minutes away. Every year, to celebrate my being alive, my family gives me some sort of present. 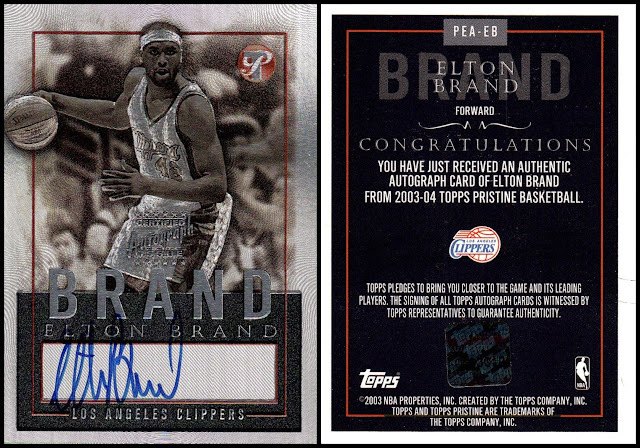 Last year, it was a box of 2013-14 Panini, this year, it was a box of higher end Eltons. #18 1999 Press Pass Autograph. 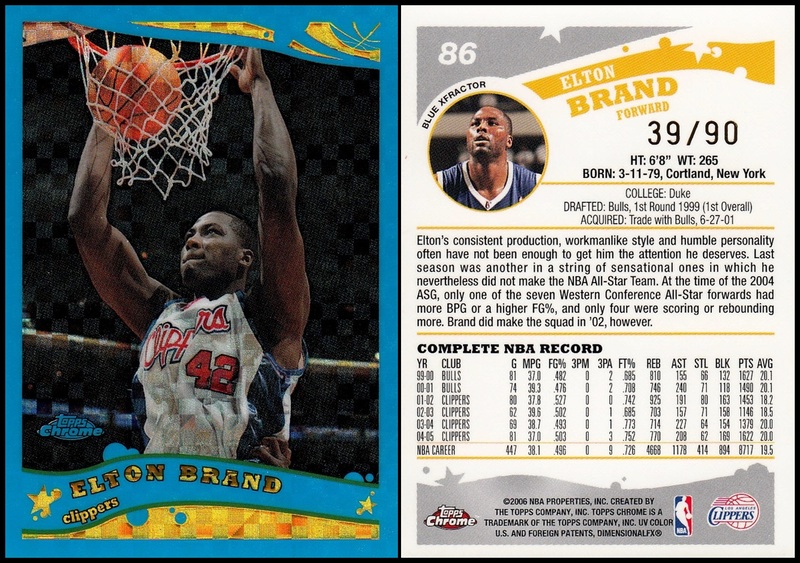 I don't really do college cards- when they go pro, then I'll collect them. 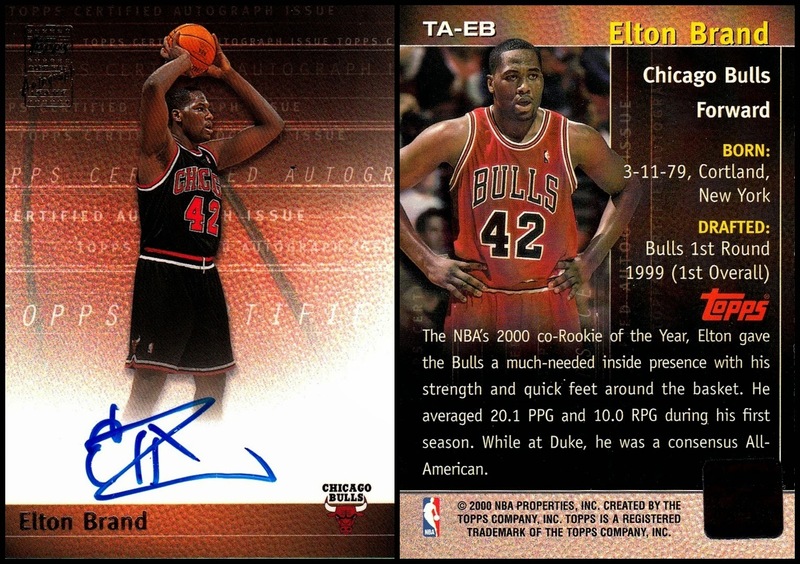 Elton is the only person I actively chase college cards of. Although I'm not sure how actively- the last time I added one to my collection was over a decade ago! #19. 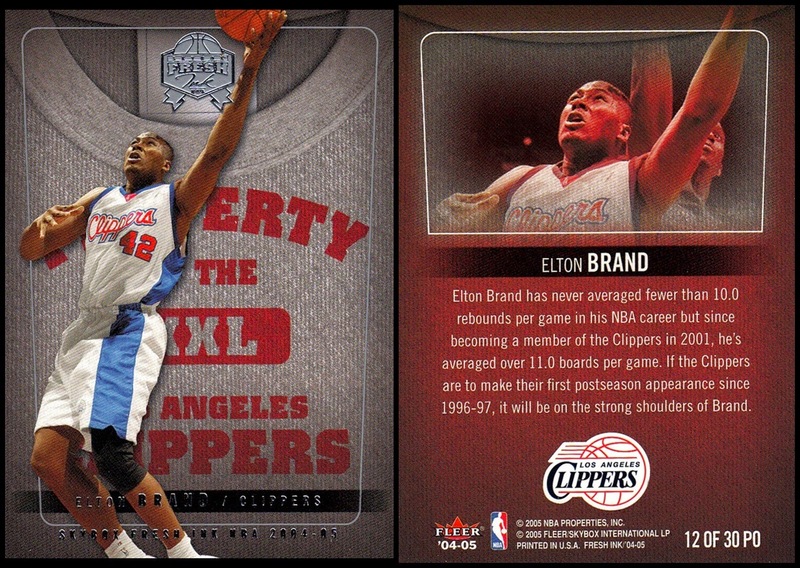 2003-04 Topps Jersey Edition. This is my first autographed Relic of Elton! I only had two of his autographs before 5/1/15, but I have a lot more now. 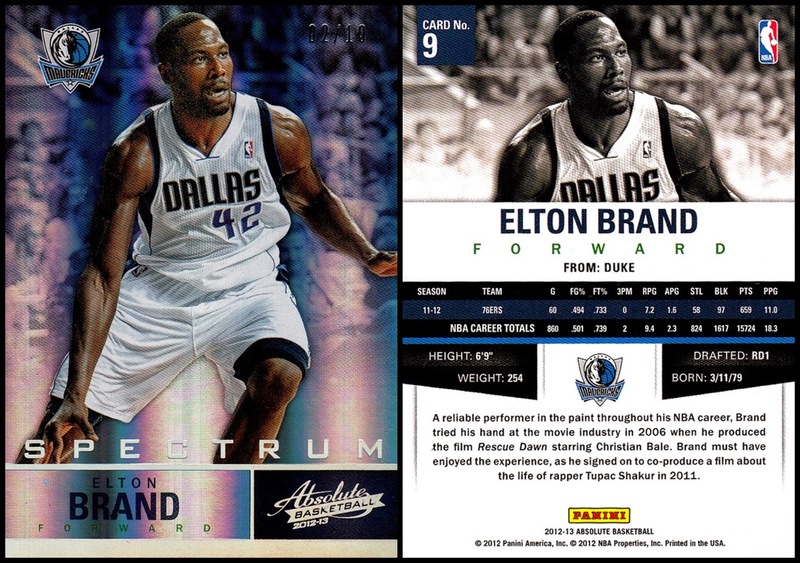 For some reason, he did not have a base card issued in 2003-04 TJE. Only an autograph. #20. 2012-13 Playoff National Treasures Material Treasures. This is now my largest relic piece from Elton. It is also the first card I have from this set. #21. 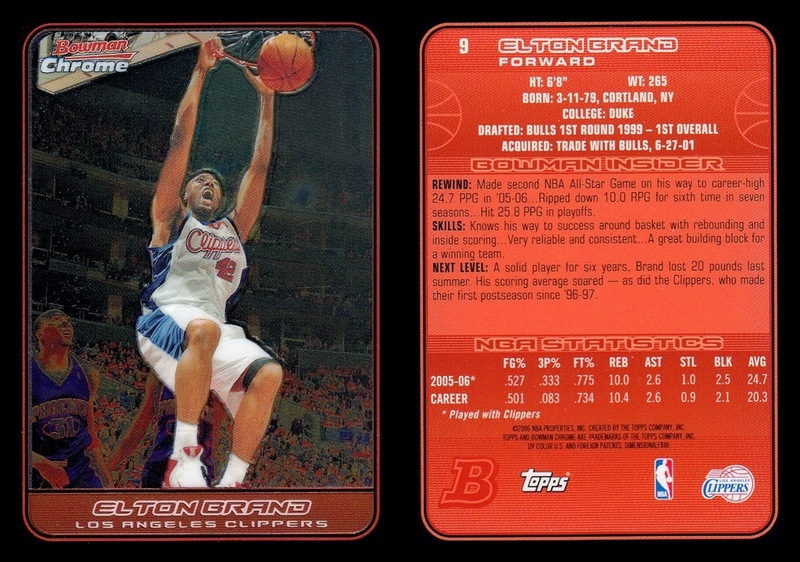 2003-04 Topps Pristene Personal Endorsements. Loved the Pristene sets. 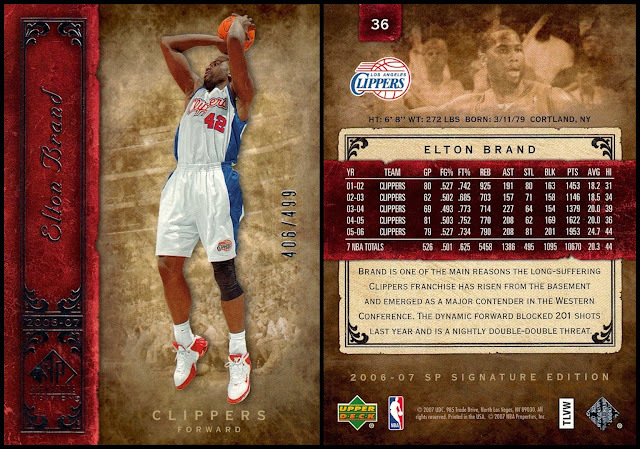 I have several from this insert set but I didn't have Elton...now I do! The back of the card doesn't scan all that well. #22. 2010-11 Absolute Memorabilia Spectrum Autograph. SN11/25! I have very few of this set, I don't actually have the base card. #23. 2000-01 Topps Autograph. 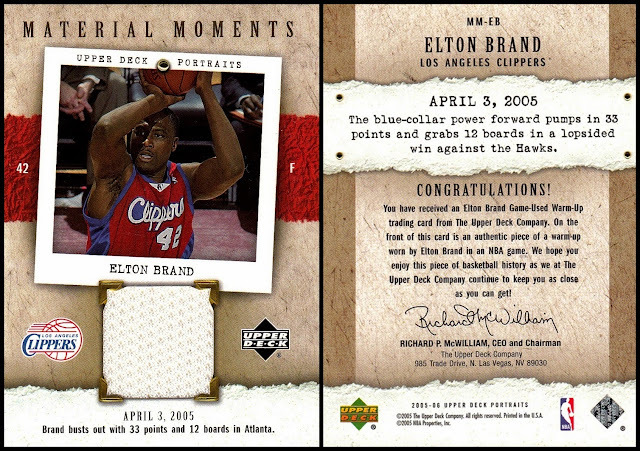 An insert from the flagship Topps set from Elton's second year. 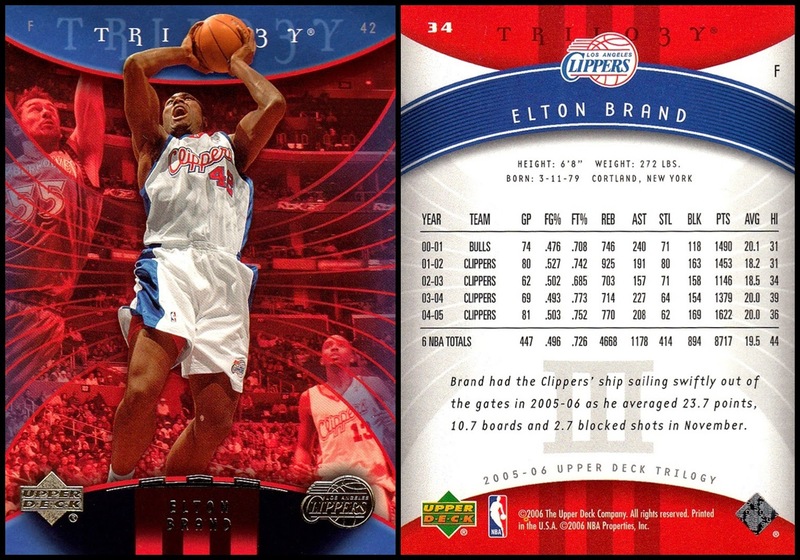 This is also the 398th different NBA card of Elton in my collection. At this rate I will hit #400 in 2015 with ease! 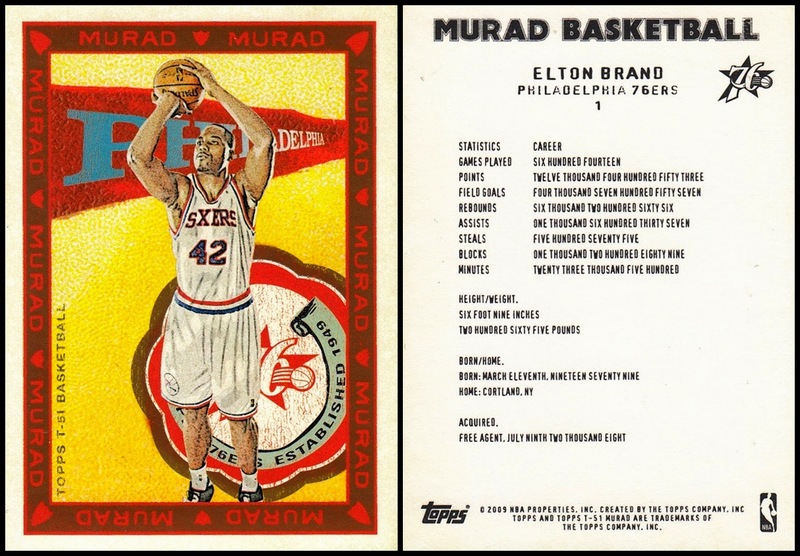 #25 #25 for 2015 is also the 400th different Elton card in my collection! It is also my first from this set, 2005-06 Upper Deck Portraits. It is a jersey insert. 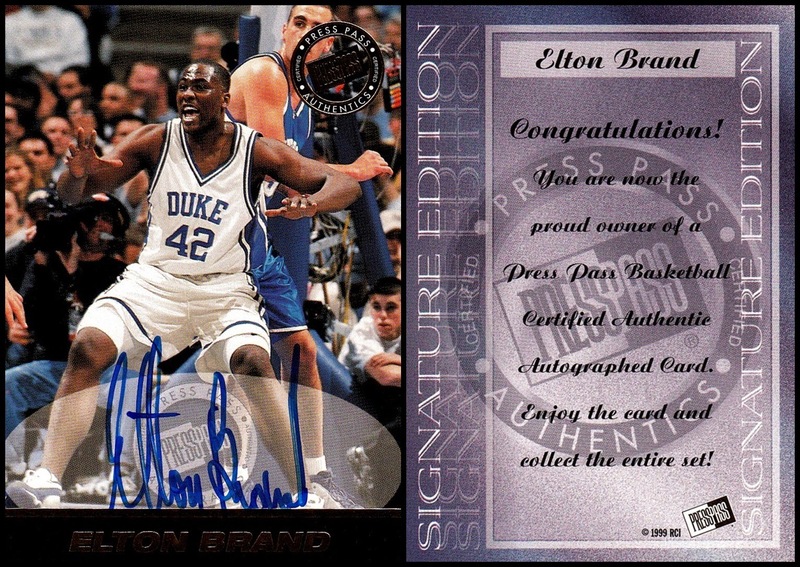 #26 is another first from a set, this time it's 2006-07 SP Signature. #28 is another set previously missing from my collection, 2006-07 EX. It is, like most EX sets, clear plastic. It arrived to me on 5/11/15. 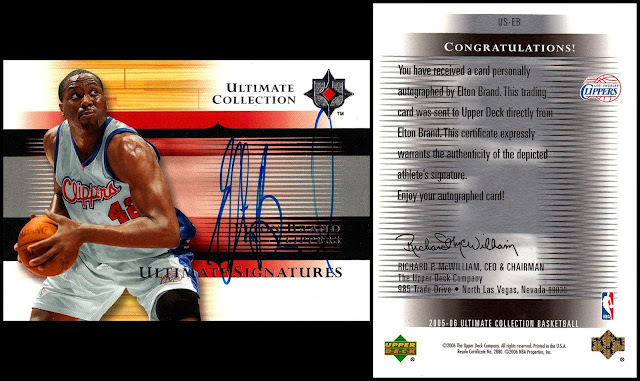 #29 2005-06 Upper Deck Ultimate Collection Ultimate Signatures. Arrived to me on 5/13/15. Ultimate Collection sold for $500 for five cards originally so I naturally didn't get them. 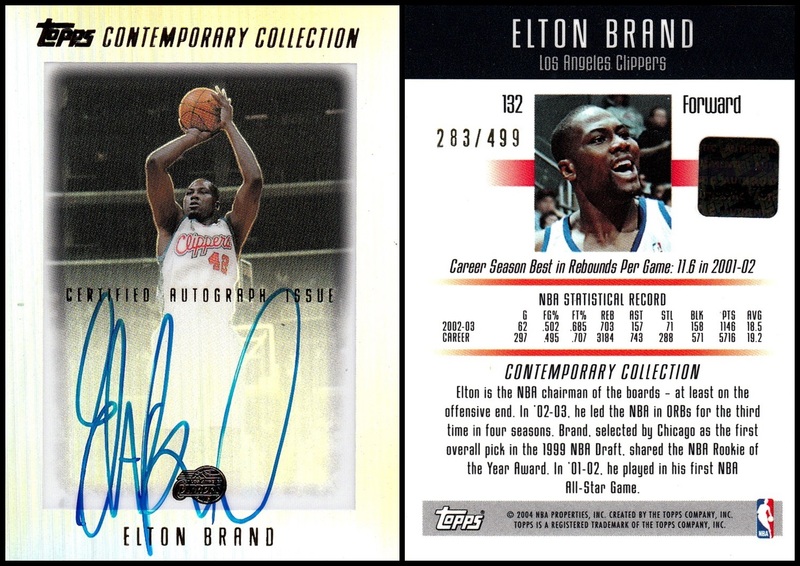 #30 2003-04 Topps Contemporary Collection #132, AU. This is a set I've always liked, scans don't do it justice. Every card is printed on Refractor technology, sort of. #31 & 32 2005-06 Topps Chipz. 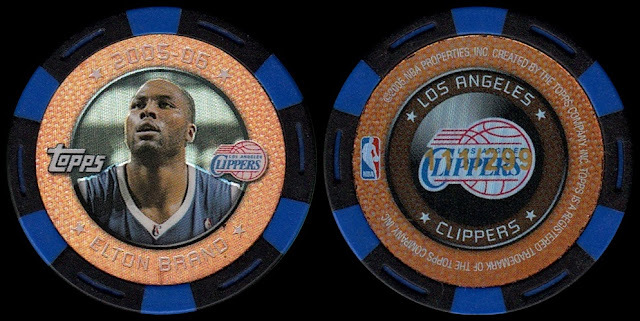 I am not too sure if I want to count these as cards- they are poker chips. 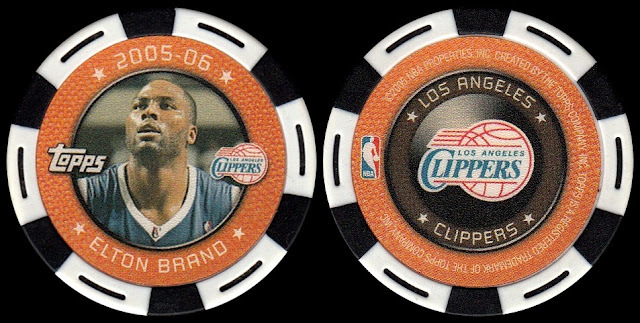 However, I included and counted when Press Pass issued them in the 2009 Wheels Main Event set, so I include them here too. I got both the base and blue holofoil version of the Eltons from one of the Facebook card groups. The blue one is SN 111/299. #33. 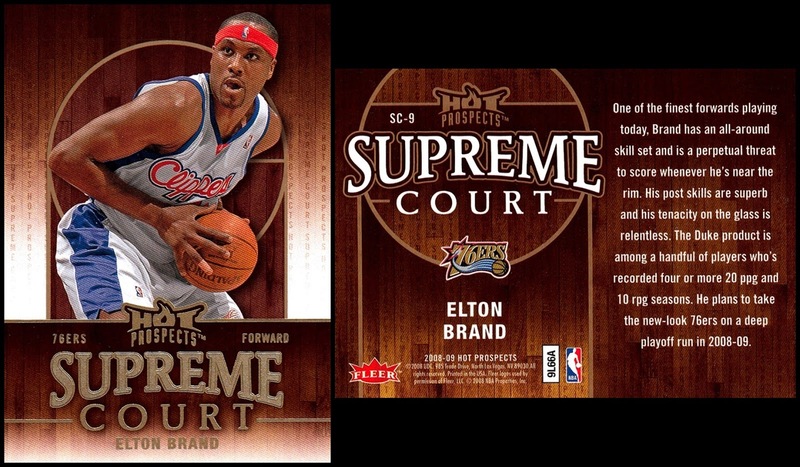 2008-09 Hot Prospects Supreme Court insert. I received this one as a Random Act of Kindness in July 2015. #34. I got this one on August 10th, 2015. I keep track of when I get my cards and August 10th was the last date on the calender that I had not gotten any cards at all on- so I saved a stash to open that day, including half of a mixed box. 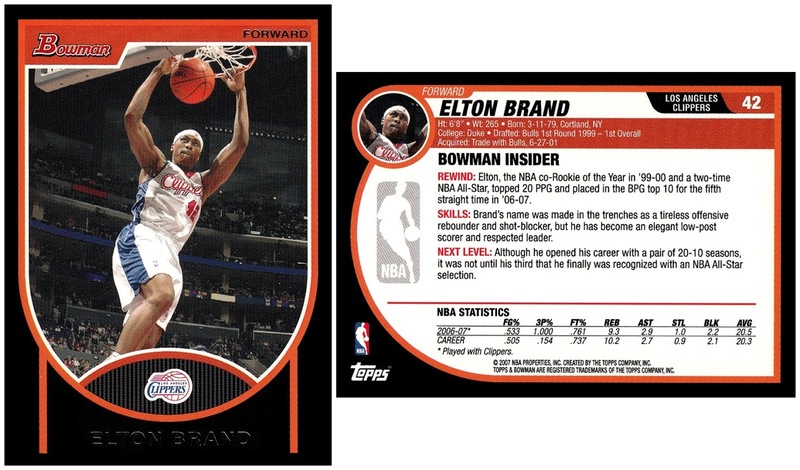 This Elton was in it, from 2007-08 Bowman. I had no idea, however, that it would be the last Elton card I got during his playing career, as he announced his retirement on August 11th. 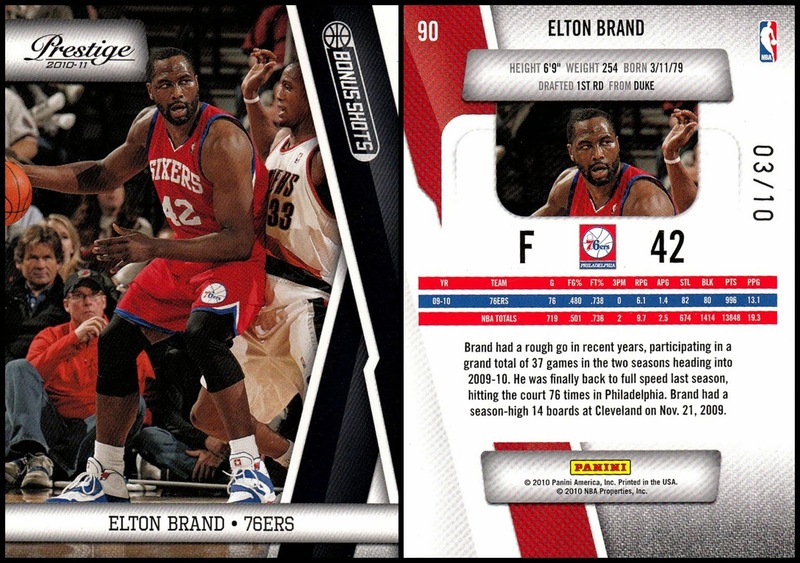 It is the 409th different NBA card I have of him. Since the card has a black border, I also created a white backdrop and green backdrop version of it as well. #35. 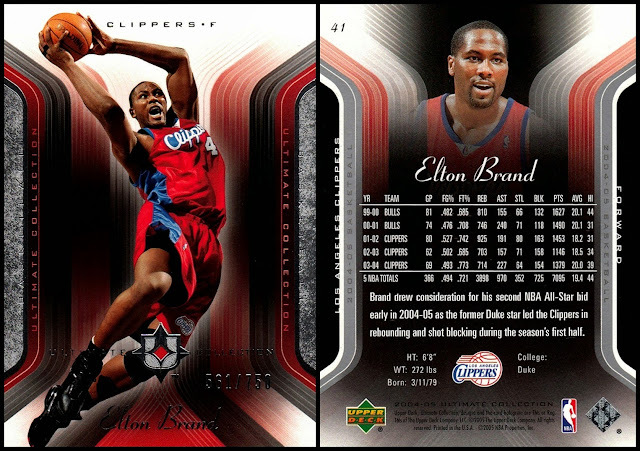 Been a while since I added any Eltons to my collection, and then I add two in one day, on November 7th. First up was his 2013-14 Hoops base card. I am less than 20 cards away from the complete set, but Elton had eluded me. I finally hunted down a copy! #36 I have never seen a blue Xfractor from this set before, and they weren't listed on the Database, but I got this one from a friend. I suspect they were box-toppers as it came sealed in one of those holders Topps tended to use for that. #37 After my Top 10 Boxes I want to Open post, my mom got me a box of 2005-06 Topps Chrome, which was #1 on the list. 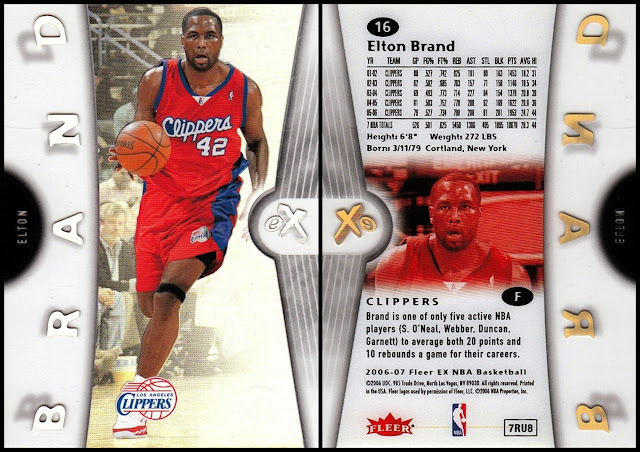 Not only did I find out that the suspicsion I had on the Blue Xfractor was correct, I also got the base Elton card, which I did not have before. Now I just need the Refractor, Black Refractor, Gold Refractor, X-Fractor and whatever other parallels they did that year. 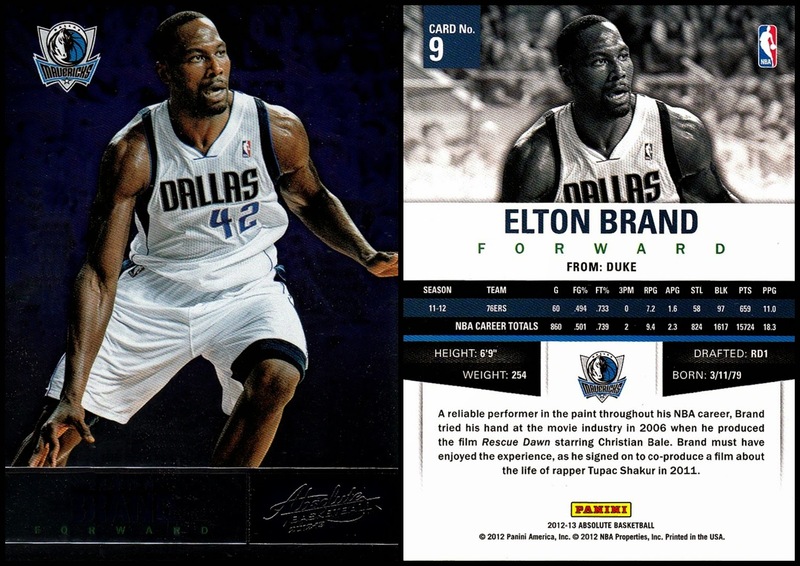 #39 2010-11 Panini Season Update #22. I had only two cards from this set but got a box for Christmas. One of the new cards I got was Elton. 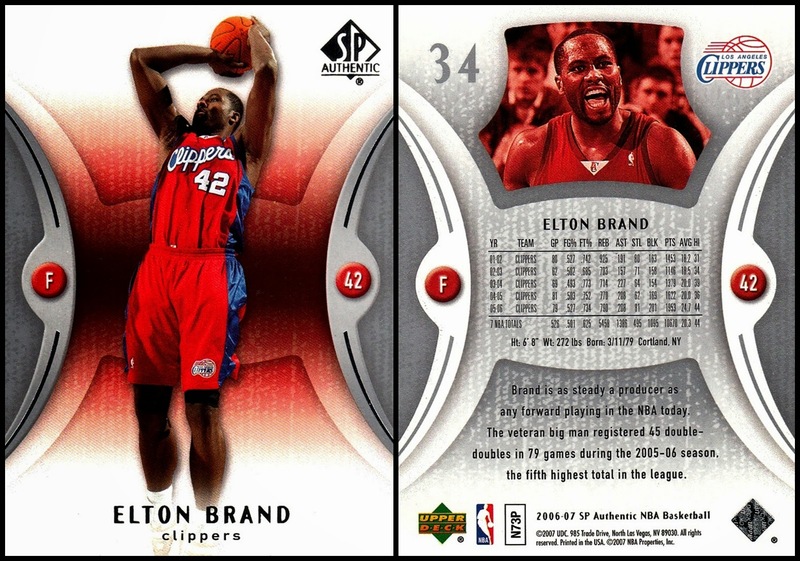 #40 2008-09 Topps Tipoff. I had not gotten any of these cards, but also got a box for Christmas 2015. 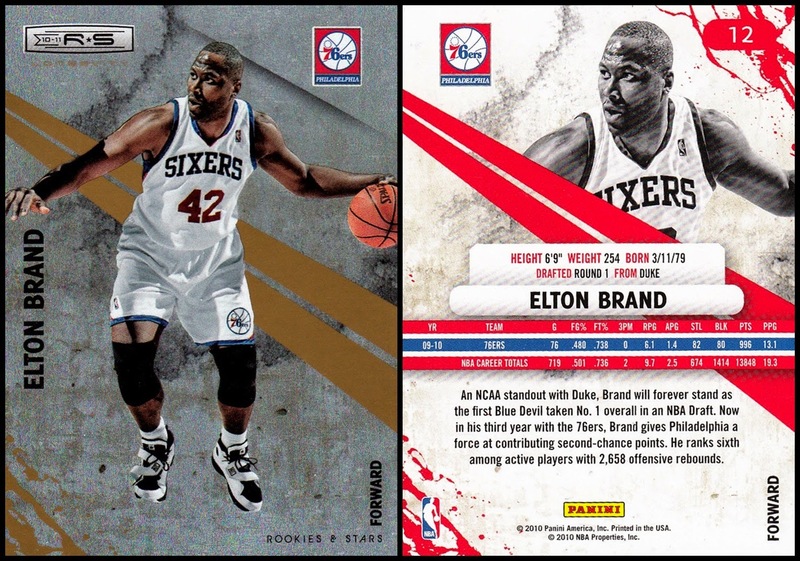 I ended up completing the set, so naturally the Elton in the set was new. This is the final card I added of him in 2015, a very good number. 2014 saw me add only 9 cards of him so this is a huge improvement. Looking through my Excel chart that I type all my cards into, I discovered that I forgot to include on on here! 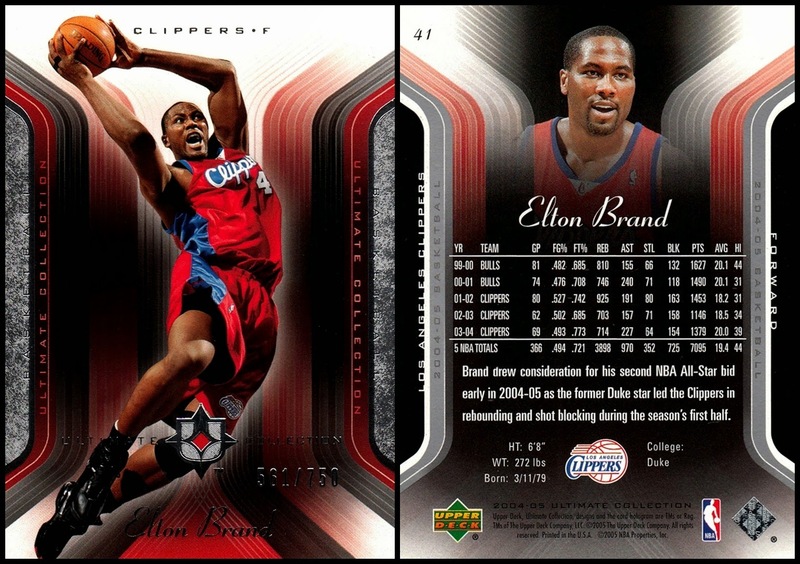 On March 24th, I added the 2010-11 Rookies & Stars base card but did not include it here. That makes 41 new Eltons on the year! With 41 new cards, Elton ranks third in new additions during 2015, behind Terry Labonte (70 new cards) and Kobe Bryant (48 new cards). I only have 2014 and 2015 typed up so I do not know if this is Elton's best year in my collection or not. As I type this, 1/12/16, I've already added 1 new Elton in 2016. Good tribute to a good guy.